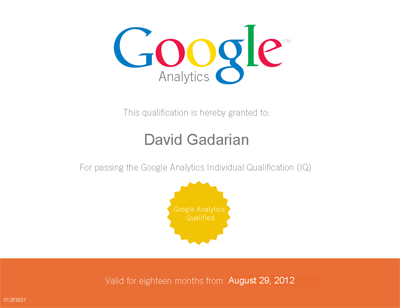 Very happy to announce that I have passed the Google Analytics Individual Qualification (GAIQ) exam! What This “Means” for Gadarian Digital? Just like with people, businesses have the capacity to grow, and to evolve. One area that I have been very focused on is the idea of business improvement. I am constantly thinking about how I might grow my business and where I will be able to provide increased value for my clients. Toward that end I have personally made, and will continue to make a very big effort to align the Gadarian Digital offerings with what Google is doing (you may have seen my Googelize Me post from earlier this year.) That is not to the exclusion of other critical items, technologies and platforms, but rather as a way to further complement them. So in part taking the Google Analytics Individual Qualification exam is in itself significant, but it also speaks to a larger ambition of my company – the desire and ability to continue to offer the best for my clients! While the exam itself is meaningful as a way of demonstrably expressing both an interest and a certain amount of ability towards the use of Google Analytics, the “idea” behind setting out to pass the exam was actually much more meaningful to me. Having looked at a few posts by others who have passed the exam I am clearly not alone. The idea of passing the exam speaks to a much larger intention to provide an added layer of digital service that is data driven. For me this is a big one. Many of my clients tend to be very attracted to my storytelling background and so I have viewed the entire process as being critical to my own ability to deliver both a very meaningful qualitative and quantitative experience for my clients. And so while I can now say that I have officially passed the exam, the truth is I have been hard at work slowly moving my company in this direction for some time now. The idea is not to suddenly reinvent Gadarian Digital as an entirely new company, but rather to continue look to grow in ways that are a good fit for our internal sensibilities as well as a critical solve for our clients. And so in that regard I am absolutely thrilled to share this news with you. While the test was nice to have passed I will say that the real value was in the amazing tutorial the folks at Google Analytics put together to help their students prepare for the test. What was formerly called Conversion University is not hosted inside the Google Analytics site in the Learn section you will find the Google Analytics IQ Lessons. In here you will find about 20 detailed presentations that do a really wonderful job of walking you through the power of Google Analytics along with providing a number of really compelling real world examples that you can easily see working for your own business. We specialize in helping businesses to define their digital paths. Going beyond the definitions we also provide ongoing services to our clients to help them navigate through the digital sea with dignity and strength. 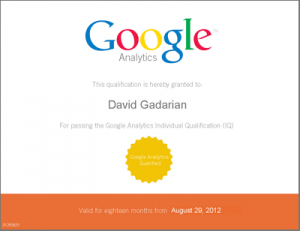 And now we are happy to say that while we have offered Google Analytics setup and ongoing management for quite some time, we are pleased to now also be able to say that David Gadarian has passed the Google Analytics Individual Qualification exam. Feel free to reach out and contact us if you considering a new, or a first time approach with your online efforts. We’d be happy to talk with you, learn a bit more about your goals and to see if Gadarian Digital might be a good fit. GglAnalytcsTest Thanks for sharing this Eric. Looks like a very neat site that you and your team have put together.